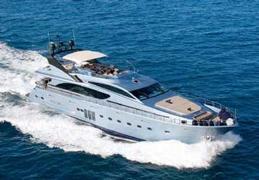 Thierry Voisin sends news of a substantial cut in price of his central listing, Bilgin's 29.5m motor yacht Makarena. Delivered by the Turkish yard in 2006, this superyacht's sleek lines and electric blue livery turn heads at every port she enters and, fully MCA compliant, she sleeps 10 guests in five staterooms. With a maximum speed of 24 knots, Makarena has had a price drop from €2.3 million to €1.45 million, VAT exempt.